I pinned both of these recipes as part of my Menu of the Month Pinterest board, and found that they worked really well together as a quick, healthy meal. If I made this again, I would add a second side to the meal, because while the kale was a healthy, delicious option—we were missing a starch that left us hungry again two hours later. Consider adding mashed sweet potatoes or mixing in some quinoa to the kale to bump up the protein. KALE: Preheat oven to 425. Place large jelly roll pan in oven as it’s preheating. Combine kale, salt, garlic, and oil in a large bowl; toss to coat. Place kale mixture on hot pan, spreading with a silicone spatula to separate leaves. Bake for 5 minutes. Stir kale. Bake another 3 minutes or until edges of leaves are crisp and kale is tender. Place kale in large bowl, drizzle with vinegar (optional). CHICKEN: Heat a large skillet over medium-high heat. Add oil to pan; swirl to coat. Sprinkle chicken evenly with pepper and salt. Add chicken to pan; sauté 6 minutes on each side or until done. Remove chicken from pan; keep warm. 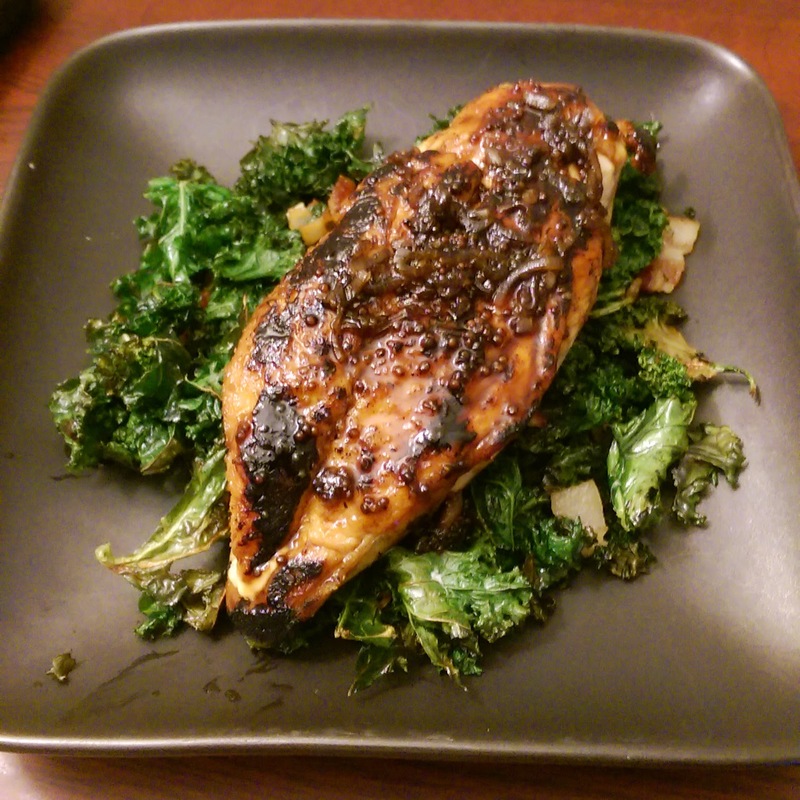 NOTE: My chicken was only partly cooked after 10 minutes, so I moved the breasts to the oven to continue to cook with the kale. They took another 5 minutes. While chicken is cooking, combine beer, soy sauce, mustard and honey in a small bowl; stir with a whisk. Add shallots to pan; cook 1 minute or until translucent. Add beer mixture to pan; bring to a boil, scraping pan to loosen browned bits. Cook 3 minutes or until liquid is reduced to 1/2 cup. Return chicken to pan; turn to coat with sauce.